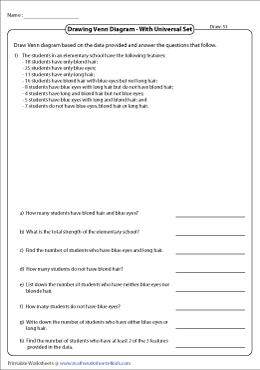 This page contains worksheets based on Venn diagram word problems, with Venn diagram containing three sets. 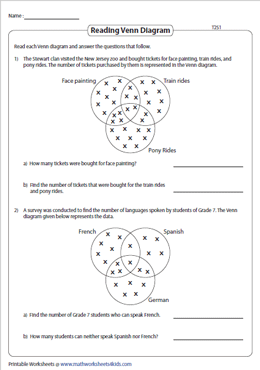 The worksheets are broadly classified into two skills - Reading Venn diagram and drawing Venn diagram. The problems involving a universal set are also included. 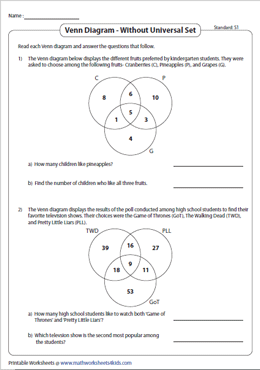 Printable Venn diagram word problem worksheets can be used to evaluate the analytical skills of the students and help them organize the data. 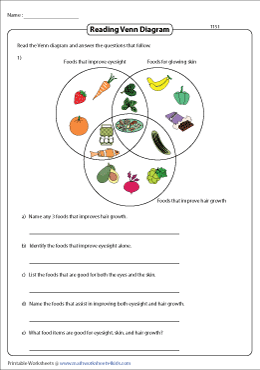 These worksheets consist of Venn diagrams containing three sets with the elements that are illustrated with pictures. Interpret the Venn diagram and answer the word problems given below. The elements of three sets are represented as symbols in the Venn diagram. Count the symbols and write the answers in the space provided. 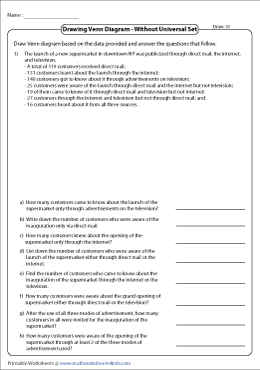 Each worksheet contains two real-life scenarios. These PDF worksheets contain Venn diagrams without universal set. Study the Venn diagram and answer the word problems. This section features extensive collection of Venn diagram word problems with a universal set. Different scenarios like doctor appointments, attractions of Niagara Falls and many more real-life scenarios are used in these sheets. Draw a Venn diagram with three intersecting circles. Fill in the data from the given description and find the missing information. The questions are based on union, intersection and complement of three sets. 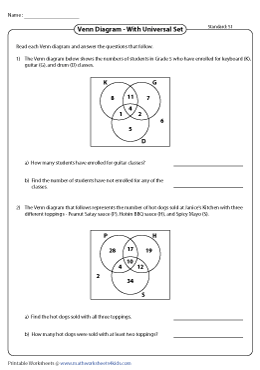 Six exclusive worksheets on Venn diagram word problems are included here. Draw three overlapping circles and fill in the regions using the information provided. Based on your findings, answer the word problems.